Moses followed a pillar of cloud by day and a pillar of fire by night. Could the Pillars of Cloud and Fire that went before the Israelites have been a volcanic eruption? Could God have used this to lead the Israelites to Sinai? Examples of Volcanic eruptions during the day and during the night. 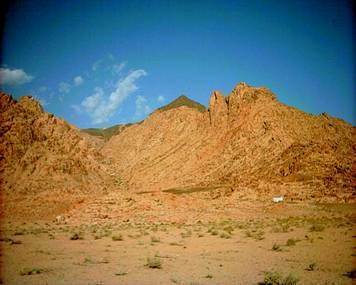 The real Mt Sinai (Jabel el Lawz) in Arabia is in a volcanic area. Could there have been volcanos erupting during the Exodus? 7When Pharaoh let the people go, God did not lead them on the road through the Philistine country, though that was shorter. For God said, “If they face war, they might change their minds and return to Egypt.” 18So God led the people around by the desert road toward the Red Sea.a The Israelites went up out of Egypt armed for battle. 20After leaving Succoth they camped at Etham on the edge of the desert. 21By day the Lord went ahead of them in a pillar of cloud to guide them on their way and by night in a pillar of fire to give them light, so that they could travel by day or night. 22Neither the pillar of cloud by day nor the pillar of fire by night left its place in front of the people. 11You came near and stood at the foot of the mountain while it blazed with fire to the very heavens, with black clouds and deep darkness. 12Then the Lord spoke to you out of the fire. You heard the sound of words but saw no form; there was only a voice. 13He declared to you his covenant, the Ten Commandments, which he commanded you to follow and then wrote them on two stone tablets. Jabel el Lawz; the real Mt Sinai, in Arabia, is in a volcanic area.